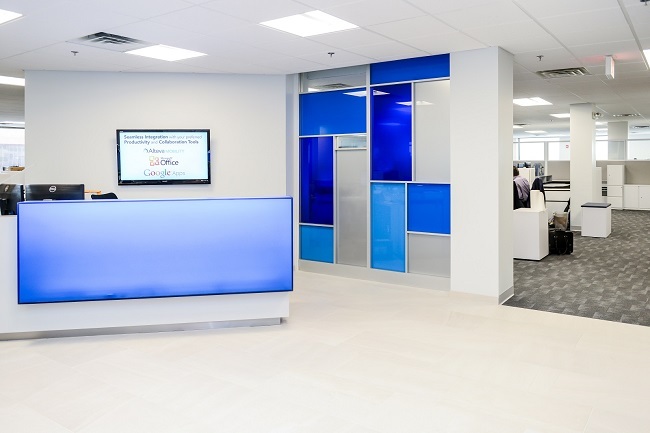 Details: Fit-out of Alteva/Momentum Telecom’s operations and marketing center. 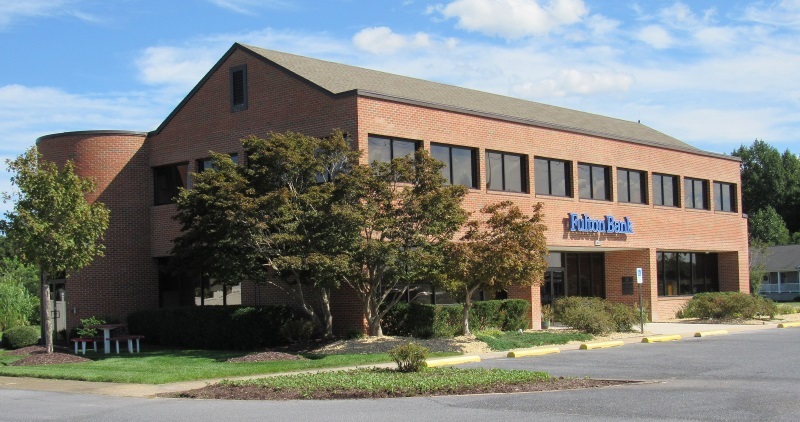 It was a full gut renovation of an existing office space, including removal of years of abandoned telecom, electrical, mechanical equipment, sprinkler lines and equipment. This project involved numerous time and logistical challenges. A big hurdle was assuring we would not disturb the two tenants below them 94.1 WYSP Sports Radio and 98.1 Oldies Radio stations. The excessively noisy demo, core drilling and metal framing for walls had to be closely coordinated to assure they were on “pre-recorded loop tape” or on “remote location broadcast” modes. 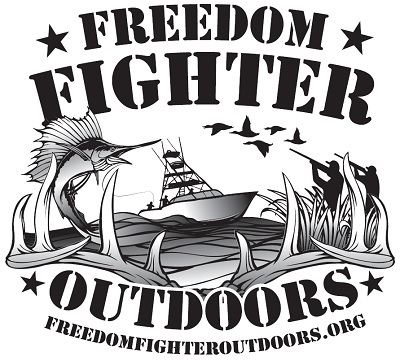 We were successful in integrating our work with their operations, and no disturbances to air shows occurred. We also had to coordinate construction related deliveries, contractors and inspectors so they did not interfere with the other tenants, guests or the building management in any way. The timeline allowed for approximately 60 days from start of demo to occupancy permit. Given the rectilinear construction, the mechanics of “building” the space out was not nearly as challenging as it was to assure all long lead time custom items, such as the Allure Glass Wall Systems, custom LED fluorescent lighting and acoustic ceiling systems that needed to be ordered, measured, manufactured and installed in a timely manner. All work was completed on time and budget, expending zero dollars from the contingency fund. 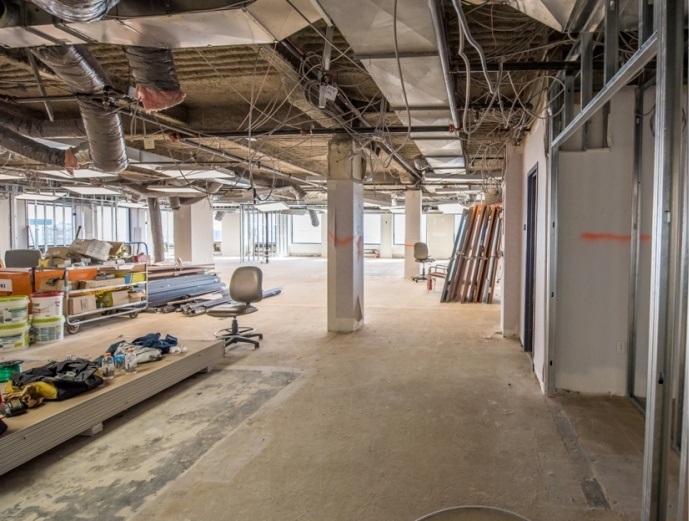 Details: One of five concurrent fit-outs performed at 400 Market Street, Philadelphia, PA. Quick turnaround of 60 days to perform select demo of the existing office layout, in preparation for their new headquarters. The fit out was approximately 13, 000 square feet. Ansul Construction executed all work in an operational high rise building interfacing with the buildings tenants and their guests. The space was seamlessly constructed having weekly meeting with PYN to discuss the schedule logistics and budgets for the fit-out. All work had to be closely coordinated with the furniture supplier, IT Professionals and the moving company to assure no issues occurred that would disrupt PYN’s start up in their new space. We were responsible for removal of all existing and abandoned electrical lines, mechanical equipment, plumbing and fire suppression equipment. We installed new electrical runs for power and lighting. This included setting new high efficiency led fluorescent fixtures. New HVAC equipment was installed with oversized units serving the IT/Server Room to assist in tempering the extreme heat of the IT systems. New training rooms and kitchen/vending areas were added to accommodate the high volume of employees at this office. All work was completed on time and budget with no use of the contingency monies. Details: Removal and replacement of 158 exterior wood decks. The project involved engineering, designing, permitting and construction related to the upgrade work. The decks were completely removed down to the existing cantilevered, 6×6 angle steel that was embedded in the building structure, first constructed in the 1970s. Any oxidized steel that was significantly compromised was repaired prior to installation of the new deck structure. The new decks consisted of new pressure treated ledger boards that were fastened with Hilti 1/2″ threaded rod with epoxy sleeved anchors and new out board beams bolted to the angle steel. The steel need to be punched to receive the new bolts and clips to support the beams. New pressure treated floor joists were installed 16” on center to meet code and the manufacturer’s recommendations for the composite decking. Band boards of 2×12 were installed with 5/4×6 Timbertech decking set inside with blind fasteners. The railing system consists of high quality, engineered aluminum posts, top and bottom rails with square balusters. This creates a rigid, safe, code compliant guardrail and aesthetic rail. Details: Mike Ansul was hired and served as the Construction Manager/Senior Project Manager for a $22 million renovation of the athletic facilities at a local community college. The building construction work entailed select demolition of the existing gymnasium, locker room and associated support rooms. Major challenges existed, included having to remove and upgrade the existing power, sanitary and water utilities, supplying the entire campus, without disruptions, during the school year. These items ran through the existing gymnasium building, they needed to be removed and re-routed to the new mechanical room within the existing administration building through 1500′ of underground duct banks. The new building façade was a direct tie-in to the existing athletic building facade, incorporating underpinning of the existing structure while the foundation and pier work was performed in an adjacent excavation. All pier footings and associated structural steel had to be carefully surveyed to assure the existing and new sandstone facades would “marry up” upon installation. 15 acres of the undisturbed site were improved for new tracks, baseball fields and tennis courts on an engineered, terraced site to accommodate the wide elevation and slope changes. The project also included 10 acres of newly terraced parking lot areas with pickup/drop off areas in front of the new building. All of these areas had to be sculpted into the very challenging terrain that existed, rigorously controlling runoff, temporary and permanently. The work was rigidly regulated and monitored for compliance with L&I, the watershed district and soil conservation districts officials– entailing phasing of work, temporary and permanent bio-retention areas for sediment and runoff controls, all due to the close proximity of a major watershed for the headwaters of a major local bay. Details: Michael served as project manager for the complete tear down of an existing bank branch and construction of a new branch facility, a $1.8 million project. This project entailed demolishing an outdated bank branch, mobilization and commissioning of a dual temporary modular trailer/branch and construction of the new branch ALL on the 1/3 acre site, while the bank remained operational. This temporary facility had to be fully compliant with all banking standards for operations, security and ADA compliance. Complete new services for water, sanitary and utility installations had to be done for this temporary facility. Separate temporary MOT and entrances had to be established for safe entry and exiting of the site for construction purposes and customers, as well. The new branch was a masonry and steel structure with two ¼ round curved standing seam metal roofs and one flat membrane roof. All new services for utilities, water and sanitary lines had to be set for the new facility. New highway entrances and exits had to be installed to meet National Highway Traffic Safety Standards. The building was slab on grade, metal stud framed with numerous curved interior demising walls to carry the theme from the roof shapes. All interior offices had wood panel full lite front walls for additional safety and visibility of the teller line and entrances. The floors were imported Italian tile with tile base. The curved teller line was a combination of Corian, decorative brushed stainless and wood. New vault and safe deposit boxes had to be installed with the associated safe deposit privacy rooms. The project was completed in less than 90 days and was on budget with no disruptions to their daily banking operations. Details: Perform interior and exterior building renovations on an operational bank branch to improve energy efficiency and update the appearance. All exterior siding and windows were removed. Masonry was pointed where mortar had fallen out. 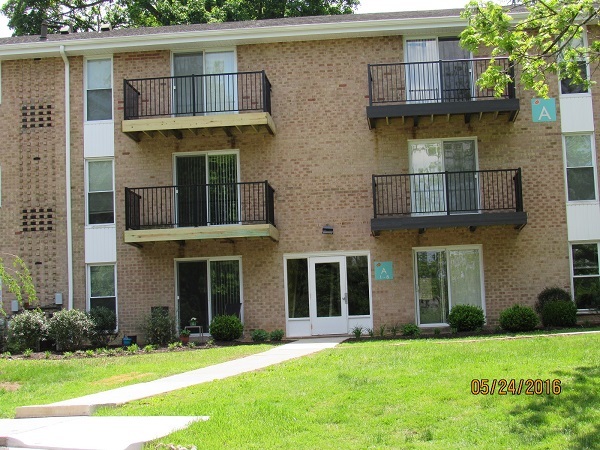 New, custom-sized Andersen 400 Series, Low-E window units were installed in all existing openings and the associated interior trim was upgraded for a more current feel. All of the existing cedar beveled siding was removed and replaced with Hardi-Siding, beveled siding with a slightly larger reveal to improve the exterior look. New copper gutters and downspouts were installed upon completion of the siding. New bollards were installed at the transformer and drive through “tube” locations with modern, no maintenance, high visibility bollard sleeves. The interior received a soft renovation consisting of designing, fabricating and installing a new teller line, removal of a large 10’x10’ stone planter in the center of the lobby, new carpet and paint. The restrooms were renovated with new tile floors, fixtures and lighting. New site lighting and landscaping lighting was installed with minor landscaping improvements. Details: Perform a building envelope evaluation and renovation due to a continual problem with water infiltration at all storefront window units and resulting interior environmental problems. 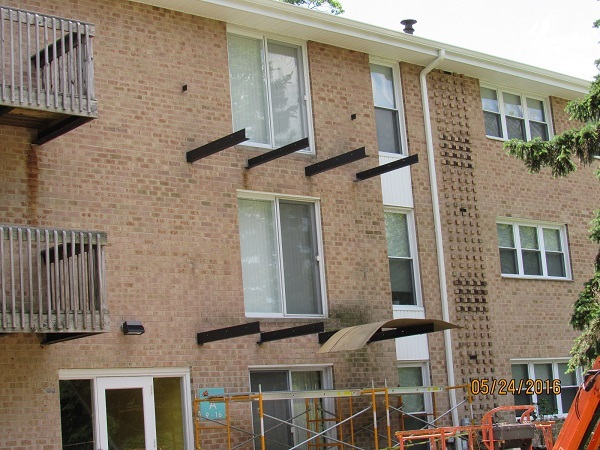 Upon commissioning a water intrusion consultant, we determined the need to remove the row lock and head courses of brick to survey head and sill flashing and the condition of the related structural steel. Upon review, no head or sill flashing had been installed when the building was constructed two decades ago. The resulting water intrusion caused severe oxide jacking on all welded joints and compromised the thickness of the steel substantially. All finishes including insulation and drywall had to be remediated of mold and mildew, including extensive replacement. All work had to be completed without disrupting bank operations. A qualified masonry contractor was hired to temporarily shore the brick facade for limited removal and replacement of the brick above and below the storefront units for access to execute the structural steel repairs. All structural steel lintels were removed and replaced with new primed and painted steel. Head and sill flashing were fabricated and installed prior to brick replacement. The brick was matched and replaced, upon the 30 day cure, the masonry was treated with an industrial grade masonry sealer with “Zero” affect on the color. New Kawneer Storefront window and door units were installed throughout. All areas of repair were professionally caulked using a color matched urethane sealant. The work was completed in 45 days, within budgets, with no disruptions. Details: Construction of new retail building involved razing existing structures, preparing the site and pad site with associated utilities. The site had a new well drilled for water, and had a holding tank and pump system for waste water. A holding tank needed to be implemented due to the lot size not allowing for the mandated distances between the new well head and septic field. We ran new underground utilities to power the building and wired underground for lighting. The site had a retention area for runoff under the pervious blacktop parking lot due to the limited size lot. The site needed to meet ADA requirements for parking, entry to the building and sidewalks. The right of way sidewalks required a number of re-engineering measures utilizing cuts and fills to meet DelDOT and ADA standards. We had to cut a new entrance and approach to the store to meet National Highway Safety Standards. The work required stringent adherence to health, utility, soils and environmental regulations with inspections by each agency to allow the next phase of work to proceed. The pad site required a large amount of excavating and related exporting of unsuitable soils to meet the necessary engineering standards. The imported fills had to be placed with proctoring by an attending engineer, to establish correct compaction of the fills, prior to excavating for foundation work. The construction of the building was basic stick frame construction with engineered trusses. There was extensive fire rating of the exterior façade that was required on the back and south side of the structure due to its proximity to property lines and Delaware/Maryland State Line. This was accomplished by placing 2” of gypsum fire rock over the exterior sheathing prior to installation of the insulated vinyl siding.